I just decided to sponsor my first Compassion child. Well done, bloggers in Uganda. You made me cry. 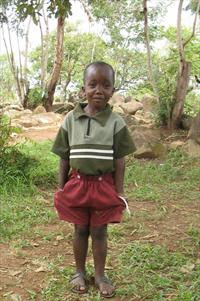 And now I’m spending a mere $32 a month to sponsor 5 year old Fred. And I won’t regret it for a minute. He looks like the coolest dude. I mean, check that face out! I laughed out loud, through my tears, and then I clicked “sign me up and let me give that kid a hug!”. Ok, that’s not what the button says, but it’s what it said to me. And now, a Compassion rep will give Fred a hug. From me. His sponsor. Tell me that doesn’t make you smile. Fred, people. His name is Fred. That’s priceless. Maybe you should sponsor a kid, too.